If you’ve been googling for the most innovative rangefinders on the market, then consider what I have here for you today in these Golf Buddy reviews. I’m talking about exploring all there is to see: the wearable units, voice capable devices, and even super-accurate and versatile laser rangefinders. When you want high-tech, there’s no other path to follow than the one that leads to the center of the green. 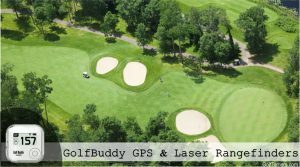 That path also leads you straight to GolfBuddy. When you want variety, they have it all. For a company that you could consider “fairly new” to the market, with just over a decade under its belt, it’s certainly pumped out quite a production line in the rangefinder industry. With innovation and accuracy as the leading principles in their manufacturing process, you can expect some pretty top-notch measuring devices from this brand. Let’s take a look at what gadgets you could fortify yourself with for your next round on the course. Whether you’re looking at a laser rangefinder, a voice activated golf GPS, or even a souped-up GPS watch, you’re definitely going to have the doors blown wide open for you today. We’ll cover everything from functionality, accuracy, and speed to wearability, durability, and cost. Take a moment to grab yourself a bib, because “gadget-hungry induced drool” is inevitable. Get ready to have to make the hard decision and narrow down the choices as we compare Golf Buddy models available to you.